Aligned with the Common Core Curriculum Standards for 1st grade. 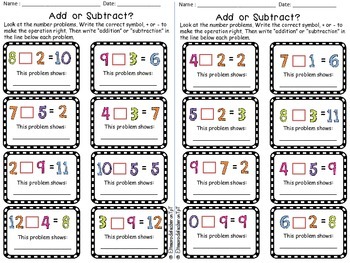 Designed to reinforce their thought process in identifying simple mathematical operations. This card game is ready to be used in several ways. As an independent activity, if you cut each page in two, it would render 8 student pages. As a card game for math centers, if you cut each card and laminate it, you will have 64 different cards to sort by operation. 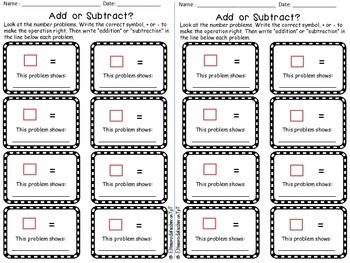 This way you could use them as flash cards during small group and intervention. 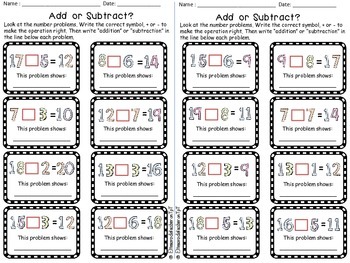 The first two pages include combinations with totals up to 12. The last two pages include problems with totals from 10 to 20. I added one extra page for you to create your own problems. 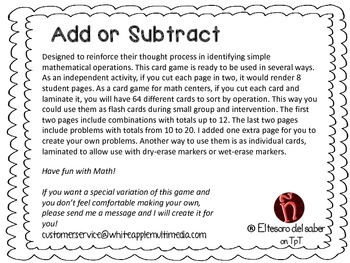 Another way to use them is as individual cards, laminated to allow use with dry-erase markers or wet-erase markers. REMEMBER that all of our products are also available in print form! Ask for a quote on any of them… We print color pages on cardstock and black and white pages on regular copy paper, plus we do not charge you for the cover and credit pages!